The latest buzz in cosmetic surgery is the use of the most researched drug in the market, BOTOX in Thailand, not on the muscle, but on the skin. According to researchers, when BOTOX is injected directly on the upper layers of the skin or the intradermal area, it acts to refine pores, reduce oiliness of the skin, improve skin tone by somehow evening it out, and helps blemishes heal faster. Though this treatment is far from establishing definite authority in skin care, most patients who had undergone the treatment in our clinic see very promising results. HOW DOES BOTOX FACELIFT in Thailand WORK? BOTOX, when injected directly to the skin instead of the muscle, triggers pores to contract causing tightening of the skin while creating a lifting effect. This happens because our skin contains tiny muscles that control the size of our pores, therefore, when BOTOX is injected, the muscles are weakened and as a result, the pores becomes smaller, giving the face a smoother feel. This is particularly effective on the cheek and nose area. BOTOX injection in Thailand also stimulates collagen formation, making the result look more natural. For the lower part of the face, MicroBOTOX works by neutralizing the downward pull of the platysma muscle, therefore giving the cheeks and jowls a lifted look without surgery. HOW IS BOTOX FACELIFT in Thailand DONE? BOTOX facelift or MicroBOTOX in Thailand is done by distributing very small doses of BOTOX all over the face using tiny needles. Usually, topical anesthesia will be applied to your face for 40mins before your doctor, Prof. Somyos Kunachak, starts injecting BOTOX. The treatment will take less than 30mins, then patients can relax before being discharged. There is typically no downtime and no swelling after the procedure. Depending on your skin, you may get some bruises or redness which is normal because of the injections but usually only lasts for a day or two. Pain is never an issue because patients usually only report feeling like a scratch but no discomfort at all. Like all other BOTOX treatments, the result can last for 3-6 months then you will need another session with your doctor if you want to maintain the result. HOW IS BOTOX FACELIFT in Thailand DIFFERENT FROM OTHER BOTOX TREATMENTS? Basically, BOTOX facelift works on the skin, while the traditional use of BOTOX for cosmetics works on the deeper muscles. Though both techniques are the nemesis of aging, injection on specific muscles goes for the traditional approach while addressing the whole face in general goes for the MicroBOTOX in Thailand. Like all cosmetic procedures, results vary from patient to patient, but in the majority of the patients who received treatment in our center, our patient appreciate the “matte” finish of their skin, or the feel of having a good foundation over their skin even if it’s bare. Like other BOTOX injections as well, the dose can be adjusted depending on the number of times the patient has received the treatment before, their skin texture, and the overall condition of the skin. 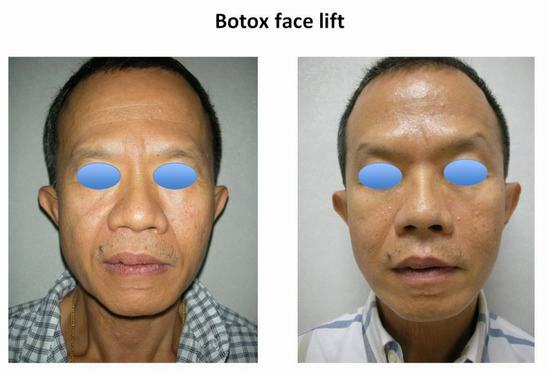 Though BOTOX facelift is quite effective, it will still not be able to correct excess skin and deep wrinkles and fillers may be needed in combination with the BOTOX Facelift in Thailand, or in cases of more advanced signs of aging, Facelift may still be the only solution. With more than 30 years of experience in cosmetic surgery, Prof. Somyos Kunachak, one of the best cosmetic surgeons in Thailand, and all of our Board Certified Doctors, had dealt with different types of patients. Though we do not claim that we already know everything about the face, our team’s expertise in the field of cosmetics and anti-aging in Thailand surpasses most other clinics and surgeons. We also take pride in providing high quality service to all our patients by using only trusted brands and products. We also make sure we don’t compromise the quality of our work by offering substandard options which may not work or may even pose harm for the patients. Aside from this, we also offer a full medical vacation package from accommodation to transportation to tours. If you are planning to have just a small procedure in Bangkok like BOTOX facelift then you want to proceed to your original vacation plan for sight-seeing and shopping, Aphrodite Inn may just be the best option for you. Aphrodite Inn is located right beside our clinic, in the center of Bangkok’s shopping district. They are accessible to Bangkok’s popular transportation systems such as the BTS line, and taxi service is available 24-hours. Airport pick up is also available provided you confirm your schedule and inform us at least 3 days before you arrive, otherwise we cannot guarantee availability.